What’s the best refrigerator for your family? Check out this expert, unbiased new refrigerator buying guide. Need a new refrigerator? What is the best refrigerator to buy? Fortunately, even the most economically priced refrigerators available today have significant advantages over older models. 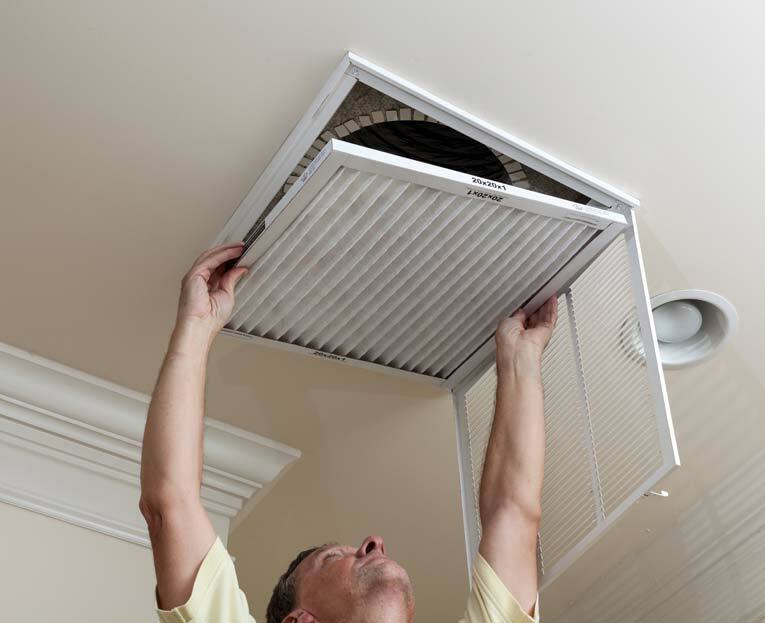 They’re quieter, do not require defrosting, and are infinitely more energy efficient. But what models and features should you consider? This stainless-steel side-by-side refrigerator has s smudge-reducing finish and features a high-quality water filter. When it comes to aesthetics, you will have a choice among black, white, almond, and stainless steel (or lookalike) finishes—and models that can be faced to match your cabinets. Consider the look of your kitchen and your other appliances, and pick a finish that will compliment them. Noteworthy: Stainless steel is a favored finish today, and could increase your home’s resale value. But stainless steel is a wise choice only if it makes sense in your kitchen. It can, for example, look out of place in a country-style or traditional kitchen, depending upon the other finishes. An additional note about stainless steel: Real stainless steel can be high maintenance because it readily shows smudges and fingerprints. Some manufacturers now offer faux stainless-steel smudge-proof finishes that are easier to keep clean and sometimes sell for lower prices. Once you’ve decided on the best refrigerator for your basic needs, think about which convenience features are most important to your family. For example, do you need an in-door ice-and-water dispenser? Or maybe glide-out baskets and shelves would make sense in your freezer compartment? Do you want humidity controls for your deli or vegetable-crisper storage areas? All of these—and much more—are available. Consequently, you’ll need to do your homework. Regarding cost, it pays to do your homework. Once you know the best refrigerator type and style for your family, research your choices both at local appliance stores and online. For example, read consumer reports, ratings, and reviews. Always ask about and factor in delivery and installation expenses if you are purchasing your product locally or shipping costs if you are buying your appliance online. And, if you don’t mind some minor blemishes, consider purchasing a refrigerator with some small scratches or dents. 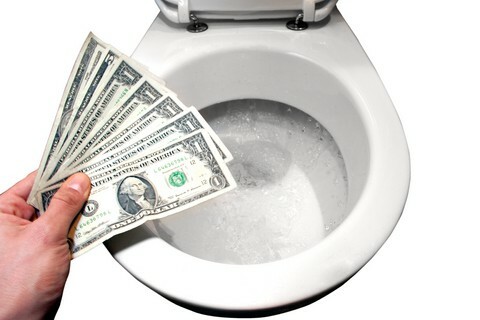 Dealers sometimes sell products with cosmetic defects at significantly discounted prices. Additionally, when seeking the best refrigerator, always look for a model with a good warranty, which should cover your appliance’s parts for one year and its sealed refrigeration system for five years. 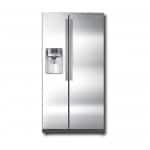 The most common type of refrigerator is the freestanding two-door model. With a top-mount unit, the freezer is at the top. 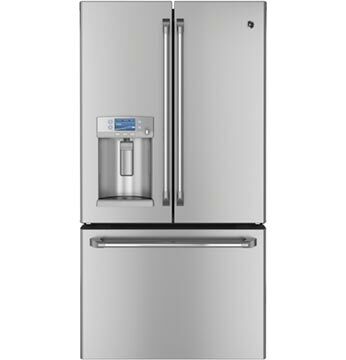 With a bottom-mount refrigerator, the freezer is at the bottom and is typically a drawer that slides out for easy access. 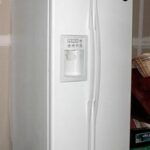 The main complaints about top-mounts are that things get lost in the back of the freezer and that the bottom refrigerator shelves are awkward to access. Bottom-mounts are becoming increasing popular, in part because they generally offer more space than a side-by-side model and, unlike a top-mount refrigerator, they put the most-used compartment, the refrigerator area, at a comfortable, eye-level height. 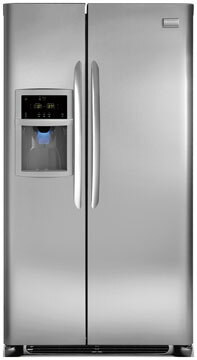 A side-by-side model offers convenient access to both the refrigerator and freezer and makes good use of door space. However, the freezer is much narrower than those in top- and bottom-mount models. Narrow freezers do not easily accommodate big items such as pizzas or turkeys. Also, side-by-sides waste a good deal of energy because their tall, narrow freezer compartments take more energy to cool. Most conventional refrigerators are 28 to 34 inches deep, so they protrude a few inches from cabinets and countertops, which are 24 inches deep. The available space for a refrigerator will dramatically affect your options. Before choosing a new refrigerator, be sure to measure how much space you have for it, including the space it requires and how far out into the room it will extend when its doors are open. Remember to include about an inch of clearance at the top and sides for the appliance. In many new kitchen designs, the popular trend is toward having the refrigerator blend in with the cabinetry. To make this possible, the refrigerator must should have the same depth as the cabinets—24 inches. Otherwise, it must recess into the wall behind it. Consequently, built-in refrigerators have coils and workings that are accessed from above and below instead of from behind. And their doors are designed to receive veneer or panels that match the cabinetry. Drawer coolers and under-counter refrigerators are additional options for making the refrigerator far less conspicuous. Designed to fit into base cabinetry, under the countertop, these types of refrigerators can be faced with cabinet material so they disappear or they can be purchased with stainless-steel or glazed panels. Widths can vary from 18 inches to 5 feet. Of course, purchasing an energy-efficient refrigerator is wise, especially considering the fact that refrigerators are among the highest energy-consuming appliances in the home. An energy-efficient model could save a bundle in the long run—up to $100 per month or more. Though typically more expensive to buy, energy-efficient models decrease your energy bills and increase your home’s resale value. Energy-Star rated refrigerator operates with high efficiency. To calculate whether the cost is covered by your potential energy savings, look for the Energy Star label on any refrigerator you are considering. This label signifies that the appliance has met the strict energy-efficiency guidelines set by the U.S. Environmental Protection Agency and the U.S. Department of Energy. The yellow tag, which states the kilowatts per year consumed by the refrigerator, can help you figure out how much it would cost to operate the appliance. Couples or small families may find that a model with 18 to 22 cubic feet of storage will suit their needs, but larger families or those who enjoy entertaining will likely need more space. As a general rule, two people should have at least 10 cubic feet of refrigerator space, not including freezer space. Add 1 1/2 more cubic feet per additional family member. And pay attention to the controls. For example, energy-efficient models have thermostats that allow you to select the exact temperature settings for both refrigerator and freezer compartments. To shop for energy-efficient refrigerators online, see Amazon.com. Wine refrigerator keeps quality wines at the perfect temperature and humidity levels. If you are a wine enthusiast, a wine cooler (also known as a wine refrigerator) may be the perfect addition to your kitchen. 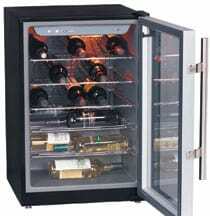 An under-counter wine-cooler refrigerator may hold from 20 to 60 bottles of wine. These pint-sized refrigerators store wine at the optimum temperature and humidity for proper aging and enjoyment. Some models are meant to be freestanding, but most are intended to be built into the kitchen cabinetry under the countertop. Depending upon the model, a wine cooler can hold between 20 and 60 bottles of wine. Most wine refrigerators have two separate zones: one for red wines and another for white wines. The door is generally made of amber or tinted glass to allow viewing of the refrigerator’s contents while protecting the wine from exposure to light. Typical features include adjustable or slide-out shelves, programmable digital controls, and door locks for security. 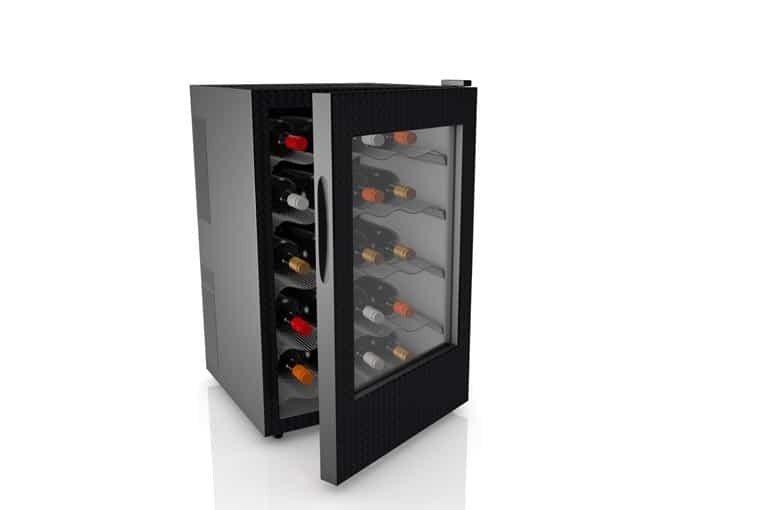 The sleek wine cooler shown here stores up to 24 bottles and comes with an electronic thermostat and interior lighting.